As Floyd Hand tells it, a beautiful lady in a rainbow colored dress appeared to him in a vivid dream May 1997 and said she soon would bring a message of peace and unity to mankind. This woman was Lila Wakan, very sacred, and could not be treated with disrespect. Lightning instantly struck the brash young man and burned him up, so that only a small heap of blackened bones was left. My childhood Lakota name given me by Benjamin Black Elk 1958, Nicolas Black Elks son, while visiting him with my parents in the Black Hills, Paha Sapa, is Lila Wakan, Very Sacred. The Thunder Beings are my guardians, thunder and lightening accompany the Thunder Beings when I am being protected. One day, he and a brother only a year younger were putting speakers together when the brother came across a rifle. He started playing with it, pointing it at people. Fiddler told him to knock it off and, believing he had made his point, wandered off to another part of the house to do something else. That’s when he heard the gunshot. In a moment of reason – or maybe it was just panic, Fiddler said – he stepped back from his impulsiveness. Marie Elk Head Fiddler is a Grand daughter of William Elk Head, This is the true original family of the Sacred White Buffalo Calf Pipe care takers, Marie and family are working at correcting the current misrepresentation of Arvol Looking Horse, He isn’t a blood family member of the Elk Head family as testified by Marie. He doesn’t possess the White Buffalo Pipe, The Looking Horse family never had it, what has occurred is nothing more than a fraud, According to reliable sources there are seven (7) modern day peace pipe in the bundle they have at his place in Green Grass,South Dakota, Marie has recently been diagnosed with a terminal illness and desires to correct history concerning the true caretakers of the Sacred Cannupa, which are her family, the true descendants of Elk Head, Arvol Looking Horse cannot produce his proof of his lineage to the Elk Head family, ARVOL LOOKING HORSE HAS BEEN INVITED TO NO LESS THAN THREE MEETINGS IN THE EAGLE BUTTE,SD AREA TO BRING HIS PAPERS AND HIS PROOF, but he never would attend. Our Group of Dedicated Lakota People have dedicated our selves to help this family correct and bring out the truth that Arvol has been fooling the world. His immediate family hasn’t been portraying the spiritual family life style unless money is involved, his brother is listed on the Rapid City,S.D. Pennington County Sheriffs web site as having a outstanding warrant for fraud and false personation. Many media outlets have been openly supporting Arvol contrary to the written requests from the Elk Head family to cease and desist, to quit representing himself as keeper Marie and her family have their family records and probate records. birth certificates etc., Much of this came out after Arvol and his current woman been exposed for using their self proclaimed position to scam money for themselves and make trips around the country and world, along with the $ 3000.00 speaking tours, plus travel expenses. In this video Marie states how Arvols dad devised a phoney pipe bundle to fool AIM and other Indian People when they were going there to Green Grass,SD after Wounded Knee ll. No one has questioned it until now. And the truth is coming out, Arvol DOES NOT have the original cannupa! Arvol Looking Horse has been committing one of the greatest frauds and HOAXES of history.The Elk Head family has been trying to stop Arvol Looking Horse and his dad Stanley to no avail over the past decades, Arvol had created a celebrity status and it has been against almost overwhelming odds, plus many corrupt tribal politicians and naive supporters who didn’t know any better. The woman told the warrior, “The Cannunpa has no honor, but when the one who holds It learns the love for all children as a mother does, then the Cannunpa becomes Sacred. This is the caring that must live in the heart of a man, but you must also protect the pipe. A man who places himself above a woman has no right to hold the pipe, for he can never understand the caring for a child as he cannot understand the caring that a mother holds within her heart. well i just wanted to say that my grandfather Elk Head Redhair my grandmother had said that he taught Black Elk when he was 13 at the Battle of Little Big Horn. I went to Cherry Creek Powwow last night and i thought that it was a Chiefs powwow and there was a picture of Martha BadWarrior and i laughed so hard at that up there for there was ever a woman a chief. Arvol supporters Amos Cook and other people are running the powwow and we have prepared to have a honoring for him and already last night they were putting up roadblocks and don’t want us to have our honoring for my grandfather. What did I ever do to these people I understand they are hateful but there is no reason. I walk my life. I noticed that I am here in the world helping to fight the wicked and soon i shall be a person in the light guiding my people of the good realm to freedom from all evil. I love to hear your courage and strength. Keep it up Big Sis. Well my mother is the one that has all the infomation that everyone is seeking and searching. With Martha BW she is from the Hunkpapa and married Eli Bad Warrior from Thunder Butte. She had never recieved the Cannupa Wakan. The Keepers had lived and would die for the right way of this life. They would never ever give the Pipe to someone that is not there on chosen Keeper. They would never give such a sacred item to a woman when the grandfathers/mothers have said to pass it down from Male to Male Generation. According to the records from Aberdeen that Martha had tried to take the Sacred item away from them in the year of 1907. She had made a fake family tree and presented to the Indian Sup. and they took it away from the Keepers. Later the Lakota people had raised a deep concern and protested at the the Old Agency and the Police took it back to the Keepers. Later with in the next two years the two police had left this world unexpectedly. My grandmother that had seen the Cannupa herself had said that they lied to a writer in the 70’s saying that they had it. The writer not knowing of anything believed them and wrote it in his book. That is how the story began(the lies). Where is the Cannupa? No one knows. Some say that the cannupa is in New York in a muesum said that Martha sold it for 6 thousand. Some say a person has it in Canada. Some say no one has it and it shall just return one day when it is right. All i know that my grandfathers had trusted the great word of their visions and listened to the talk of the unseen spirits. They would never put the sacred item in any hands because if one touches it that is not of the original blood line choosen by the Buffalo then the whole teaching would die or vanish and the Lakota would be like a lost being with no meaning on this turtle mountain. Their name is spelled Hehakapa-Elk Head. Elk Head he name is Hehakapa had a brother named Iyanke Nunpa. They fought in the Battle of Little Big Horn their father was there as a Head Chief of all chiefs. They were Elk Head 15; Two Runs 14. The cannupa had never left the grasp of the keepers expect the police incident. Then returned later. The Bad Warriors had never recieved nothing. The land that they live on is my Grandfathers’ Martha had made it hers when she had change or try to change the family tree. Publishing the story would take along time. we have all the info but the order and the writing shall take a long time. I would like to respond to Alfred Bone Shirt & Vivian High Elk’s article in the June 15, 2007 in the Dakota/Lakota Journal, talking about the traditions and sacred way of life towards the “C’anupa”. First of all I would like to say that on June 21st World Peace & Prayer Day and Honor Sacred Sites Day was a success, people all over the world praying together in their own ways and own Sacred Sites. All nations, all faiths, one prayer is respecting each other’s traditions culture and religions. There is one creator and one grandmother earth that we all share. We have gone all over the world once a year to pray with other Indigenous Nations at their Sacred Sites and to the United Nations to talk about prophecies and we as the first nations have committed ourselves to maintaining our sacred way of life. This year we traveled to Teotihuacan, Mexico City, Mexico. To offer prayers to different Sacred Sites and pray at a place where over a thousand young people were massacred in 1968. We had a run to Teotihuacan. We asked for volunteers to run and we said that we would help to raise $1,500 for each individual for the following items: passport, running gear, etc, but because of the immigration controversy nobody stepped forward and no money was raised towards this effort. Just me and the family ran with the local runners in Mexico. The other Pipestone Run on our Wolakota website was coordinated by Allen Hare and Paul Rouse Sr. family. Paul Rouse Sr. has gone back to the spirit world and the family honored me last year by giving me a brown van and the family said that the young boys would continue running for their late father. So there were two runs that we were involved with in support of prayers. Their information with where to send their support funds was posted on the website; no money was raised through wolakota! Anyone can go and see that information for themselves. We returned from a beautiful ceremony in Mexico City, a place which was governed by the state, this year is the first year that we have lead our staffs into the center of Teotihuacan to do our ceremony. World Peace and Prayer Day opened that door to allow a ceremony to take place as it did for Devils Tower aka Grey Horn Butte in 1996. After reading what was printed in the newspaper, an ongoing confusion which started on the Rosebud reservation on October 21, 2006 where a traditional Treaty meeting took place. A resolution/petition that was drafted by Vivian High Elk, Martina Looking Horse, Stacey Low Dog and Alfred Bone Shirt was presented, but tabled and not accepted by the elders in attendance at the meeting. Floyd Hand stated this fact in his Lakota Journal interview last October about this controversy. Since that time their attacks were very strong, so I had little choice but to put the sacred C’anupa away. I am the only one that knows where it’s at. So I put it under ground and now today that grass has covered it. When the time is right, I will bring it back up. The Keeper before me, my grand mother Lucy, put it away like that when she had to pick potatoes in Nebraska to survive when no longer the People supported her and also during the Wounded Knee era when our ways were outlawed, that was done. Pte San Win spirit and help is still with us all as we experience in our ongoing ceremonies, but this is what I was instructed to do when problems come to the Bundle itself. At the age of 12 years old I was given that responsibility by my grandmother Lucy Bad Warrior Looking Horse and she told me that I would be the last keeper of this C’anupa. During this time there was so much prophecies coming in time like the Eagle and the Condor, the White Buffalo Calf and all of the animals showing their sacred color and we must be the voice for the animal nations. There will be many false prophets; there will be a lot of earth changes and climate changes, which would affect our lives and our way of life. This spirit bundle, which I take care of, was handed down through generations and because it is a spirit bundle it chooses it’s Keeper. But many people have died protecting our Sacred Sites and ceremonies. My father (Stanley Looking Horse Sr.) would go to the Sacred Sites and pray with his C’anupa and as a young boy; I would go along with him to help him. He helped me understand as a boy the importance of Sacred Sites, as we are losing them to tourist attractions, people selling them and farmers. Growing up in those times, some places we were not allowed to conduct our ceremonies. I hope and pray that some day people would respect our Sacred Sites like the Sacred Pipestone quarries in Minnesota or Bear Butte in the Sacred Black Hills, where people are trying to make a Saloon. Our struggles continue today protecting our Sacred Sites. But the women who are my relatives have caused a lot of confusion, since that meeting in Rosebud and up to the more recent article by Vivian High Elk & Alfred Bone Shirt. Two traditional laws have been broken. The first law is that our Lakota/Dakota/Nakota Oyate is a patriarchal society and the (women) shouldn’t have ever overstepped the traditional headsmen that tabled their resolution in October 26, 2006 and posted it to the public as if it were passed and agreed upon. The second law, in our tradition is when a woman was with a Non-Indian, they would have no voice within our nation to speak publicly about our traditions, but they could still pray and be among our people. So this stated in our treaties by our ancestors. This is what I would like to remind our people of. And for my sister Martina Looking Horse, I hope that she can go to treatment, as many of our people have done to turn around their life and get some help, because she’s been using since the 70’s and yet she tries to be a voice for the Looking Horse family. My family can tell you that she has never been on a vision quest or has Sun Danced. My concern is her use has caused constant misbehavior with the viscous and untrue words she does publicly; goes against our traditions and misrepresents our family. This whole conflict is happening because of money that these individuals think should go to them personally and to others they convinced of their hardship that is due, any money raised is for what efforts wolakota was created for and the people involved in those efforts. There are other state and non-profit organizations that help the concerns they have and have helped them. They can also spend their energy on their concerns and creating their own program, instead their energy to attack people. I run ceremonies and my other half sits with my C’anupa in ceremonies, so when did it become tradition to break up families or use jealousy over children in the arguments in the public, because they are not directly related. In our culture we never used the word “step” this or that, when we accept a child or person as a part of our family. They were always a part of our own tios’paye, family. This is what was taught to me by my Grandmother and parents, as they too accepted people in our family hoop. In our tradition the eagle feather is the high honor among our people, because it is the main thing that we must all hold to be a part of any ceremony. If we drop an eagle feather we have no choice, but to pray to our grand father and the Grandmother earth. There are protocols for any sacred item and as a spiritual person, we take care of them or even how we speak about them. So when we talk about the sacred C’anupa we should remember the words of Pte San Win, the White buffalo Calf Woman, a spirit woman; that only the good shall see the C’anupa and that the bad should not even see it or touch it. Since the meeting in Rosebud, Alfred Bone Shirt and them have threatened to get the C’anupa and to give it to someone else, so I must listen to what was passed down in knowledge when these things happen. I struggle just like anyone else to pay to live in this society and survive. I have chosen to survive by speaking of what our work is about, as many of our own people that have earned that voice in being asked to speak of education in many areas that concern our people. But I will always stand by the protecting our sacred way of life, that the blood of our people is not for sale as in our sacred stone and as well as our ceremonies, my responsibility that comes with this position. Our traditional ways are very strict. Today people are fasting and Sun Dancing. During this time of our most important ceremonies where people are looking for good health, it was always said to watch our words, as words are sacred, they can do more damage then good to a Nation and also misrepresent who we are as a People. Young People read these things and this also goes down in history, this behavior makes our Nation look bad, these are issues, traditionally that should have been handled in a more respectful way instead of going out there in the world. Our native newspapers should be a part of this too and check out whether it is true or good for people to read. Once again, I will tell our people that once you go into that (Sun Dance) circle, you stay in there for four days and fulfill your commitment. Our people can be strong people! I would like to thank all of the people for listening to the few words that I have to say today. Thank you very much. We are in the process of getting copies of these documents out to the world. People have to wake up and realize that they are being fooled by Arvol and Paula, One of the greatest Hoaxes of the times by this couple and their families, of course they stand a lot to lose money wise, These lineal descendants of Elk Head have their papers and their probate records to prove the truth, this would hold up in any court. We, as the rightful heirs and direct, lineal descendants of the 9th Generation Keeper of our Sacred Cannunpa; Elk Head, are requesting that Mr. Arvol Looking Horse cease and desist from misrepresenting himself as the so called 19th Generation Keeper of the Sacred Cannunpa; the White Buffalo Calf Pipe, as he puts it. Mr. Arvol Looking Horse is not a direct lineal descendant, nor is he related by blood or have any type of familial ties, and nor was he or his relatives before him was ever designated to be the Keeper, by Elk Head; who was the true Keeper and had passed into the spirit world in 1914. Our grandfather, Elk Head had left a legal will in his probate records designating his eldest son, Elias Elk Head to be the Keeper of the sacred Cannunpa and designated his eldest grandson from Elias, William Elk Head to be after Elias. Mrs. Martha Bad Warrior was not his daughter, nor was she designated to be a Keeper of the sacred Cannunpa. It was traditional law that the Cannunpa was to be kept from father to son, in the ltazipcola band. Each male keeper opened the Cannunpa in need of war, starvation and sickness that involves all the Sioux Nation of the Lakota, Dakota and Nakota people to see it and pray with it. Why hasn’t Arvol ever opened it to our people to actually see the contents of the sacred Cannunpa? When the Elk Head family members have all seen it? There has been negative propaganda against our family, who are the true, direct, lineal descendants of Elk Head, by Mr. Arvol Looking Horse and his partner, Paula Horne-Mullen, as well as his family members; which has caused media censorship against our family so we can not address Mr. Arvol Looking Horses’ lies and distortions of the truth. It has also caused violent threats, violent actions/retaliations against our family members and having our personal property destroyed by his family members and followers/supporters. Examples of media censorship includes: The Native Voice newspaper, owned by Mr. Frank King and Lisa King, The Dakota Journal, owned by the Flandreau Sioux Tribe and the Lakota Country Times who are supporters of Mr. Arvol Looking Horse and who have written many supporting articles about him as the 19th Generation Keeper of the sacred Cannunpa without consulting us, the Elk Head family and allowing us equal media time. We are demanding that these news medias, cease and desist in assisting Arvol Looking Horse from perpetuating the misrepresentation and fraudulent activities as a so called Keeper and spreading any more negative propaganda about our family by writing any more articles concerning our sacred Cannunpa and give us equal media time to bring out the facts and truth as we are the true, direct, lineal descendants of our 9th Keeper, Elk Head. We are asking all individuals addressed in this letter to stop using and catering to Mr. Arvol Looking Horse and addressing him as the 19th Generation Keeper of our sacred Cannunpa which is assisting him in perpetuating his misrepresentation and all of his fraudulent activities. We, as the Elk Head family have designated Shirley Fiddler-granddaughter to the 9th Generation Keeper, Elk Head, to be our spokesperson and contact person in these matters. All questions and concerns should be directed to Shirley Fiddler @ 605-964-7313 who resides in Green Grass, South Dakota. mentioned. Many people have written books and stories of this family. story of the Elk Head Family. back to his home at Quill Creek, Fort Yates North Dakota. the Keepers because the people made such of an outcry. descendants still reside in the community of Green Grass. This entry was posted in SPIRITUAL AWAKENING and tagged Belva June Suzanne Dupree Schuldt, Buffalo, Calf, Ceremony, Fools Crow, John Fire Lame Deer, Pipe, Richard Boyden, Truth, White, Whope, Whope-White Buffalo Calf Pipe Woman-Blue Star Wiyan. Bookmark the permalink. ACTUALLY the last photo of Fredrick Dupuis & Mary Good Elk Woman, Sitting Bull’s Sister is photographed with Grandson Pete, another error Lynne Robson was paid to correct but never did…she destroyed the http://www.lookingbackwoman.ca website as my webmaster for 11 yrs & fired for betraying our trust, a heartless, conniving, ID theft, greedy bag! Her day in court is coming! For the few paying attention, our World as we know it will be changing as soon as Obama “gives” control of the internet to UN. Every Truth via Takan Tanka/Jesus Christ via the TRUE Pte Hincala Cannunpa Kin has been recently been Censored on http://www.lookingbackwoman.ca website/WP blog….& deleted destroyed! Listening currently to Soul Town Sirius Radio….my parting from you is such sweet sorrow, however I leave you with this song from when the World seemed normal. I’ve Passed This Way Before. Which now is viewed as a Revolutionary Act! As the transfer of the internet to UN completes to the Corrupt UN, Communist Censorship Globally & Marshall Law under the directive of Illuminati-Lucifarian rule will be implemented, your freedoms & World will end as you know it, & will be changing rapidly before your eyes! So collect loved ones dear to your soul, if pure of heart…you will be fine, all evil &darkness shall be purged from God’s Domain, only He controls & created. Signing off, enjoying my Fortress Of Solitude, husband (date night) animals & nature that surrounds us here. Saying goodbye to the Old World as we innocent have know it. Embrace the purge, EVERYONE….the PureHearts shall inherit this Earth. 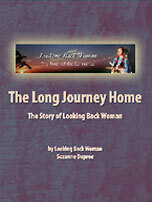 Looking Back Woman-Suzanne Dupree/HakiktaWin-Belva Schuldt signing off…..
Be true to your Heart & Soul! My love always to mankind. Be faithful unto Him, Satan is hungry for your souls. Hidden, but in plain sight serving you & CREATOR!